You want the best for your child, which includes being healthy and happy. Oral health is a vital component of overall wellness and starts by learning proper oral hygiene early. At Sherwood Dental in Ontario, our team wants to set children up for success when it comes to taking care of their teeth and gums. We believe that good habits start early and love providing dental care to children. We hope that every time your child visits our office it’s for a preventative cleaning and exam. To make this possible, we would like to share to the following tips to parents and children. Keeping a clean mouth starts even before the first tooth erupts. Use a damp cloth to gently wipe your infant’s gums at least twice each day. Start brushing once that first tooth erupts. 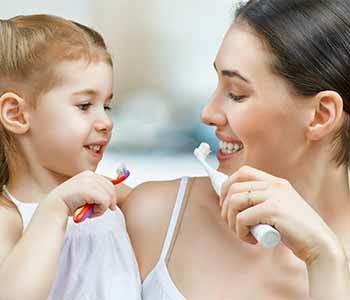 Use a soft child’s toothbrush and a small amount of children’s toothpaste. Schedule their first “happy ride”. Usually occurs around 3 years of age.This is your child's first opportunity to be exposed to the sights and sounds and smiling faces that is our dental office. They get to take a ride in the big chair, meet “mr. slurpy” and some other instrument friends, and of course go to the “treasure box”. All this is to help your child become instantly comfortable at our office long before there is any focus on an open mouth exam. Baby teeth can get decay. Don't leave your child in their crib at night with a bottle as this can increase the risk of cavities. Help your child brush. Children love to be independent and that’s great. Encourage your child to try brushing their own teeth, but be sure to help by following-up afterward. Maintain twice yearly dental visits (unless instructed otherwise by your dental professional) During these appointments, we monitor the teeth and perform professional cleanings. Helping your child establish healthy habits and an oral hygiene routine from an early age is a gift that can translate into healthy teeth and gums for life. If you live in the Oakville ON area, call Sherwood Dental today to learn about our children’s dental services.